Senj is the right destination for your vacation? Mile is the name of this object, located in Senj. This object is 300 m of air distance away from the sea. During the summer days, look for refreshments for yourself and your family on the beach that is 350 m away from the object. The beach is: pebble and concrete slabs. To stay on the beach, make sure that you bring towels and protect yourself from the sun with a hat or sunshade, and use a protective cream. Mile has a secured parking, which is another advantage of this accommodation, and is of crucial importance if you travel by car on your vacation. Any additional questions related to the beach or destination Senj please check with your host because they still know best the location. We wish you a warm welcome to our facility Mile in destination Senj. 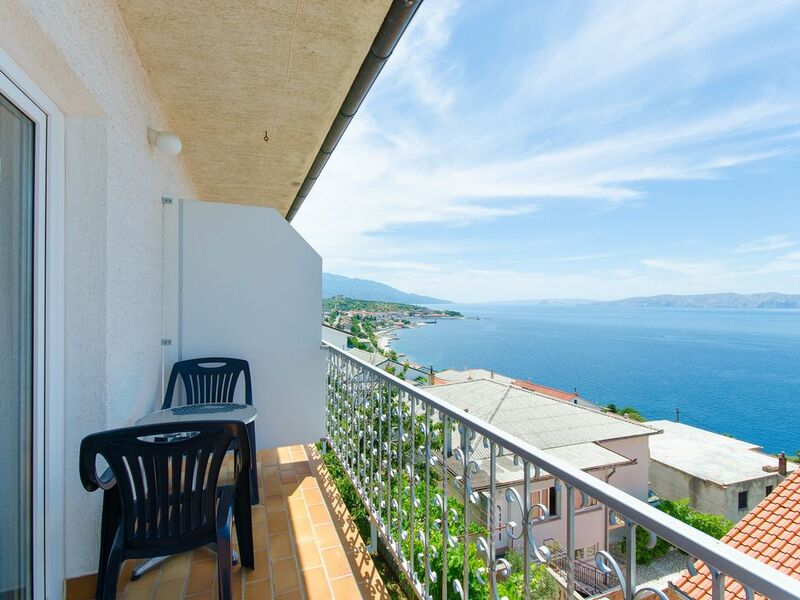 Accommodation Mile is located 300 m from the sea, 700 m from the center in the town Senj. This accommodation offers a view of the Sea and green area. Type of beach pebble and concrete slabs. Private accommodation Mile is ideal for 9 persons and has 4 rooms in the accommodation. Accommodation is equipped with: Television, Internet, Iron, Washing machine. Balcony: 20 m2.br/>Bedroom 1. Terrace/Balcony.br/>Bedroom 2. Terrace/Balcony.br/>Bedroom 3. Terrace/Balcony. Shared space which is available for use to all the guests and service provider: 30 m2. Schöne Unterkunft, sehr nette Vermieter! Jó elhelyezkedés , jó érték - ár arány. Tágas 9 embernek is nagyon kényelmes apartman , 3 fürdővel. - Nincs légkondicionáló berendezés és nem volt mikro. Dobra lokalizacja, ładny widok, duże pokoje, 3 łazienki, zamykany parking. - Brak klimatyzacji popsuł nam wypoczynek, gorąco jak w piekle, brak jakiegokolwiek nawet wentylatora, wyposażenie kuchni słabe, bezsensowne umieszczenie TV na werandzie z telewizją FTA tylko z Astry, pomimo bliskości morza zejście po schodach, dla starszych osóbw uciążliwe. Czas dojścia ok 15 min w jedną stronę.